Yesterday evening was too much fun! The hubs and Matt headed to Noblesville, IN to see a Dave Matthews Band concert so Dad came over and we did pizza and a movie. Neither of us had seen Princess and the Frog so we decided to give it a go. Despite some skipping for a dirty/scratched DVD, we really enjoyed the story. I’m not sure it is very kid friendly though. Some of the characters were terrifying! We ended the evening on a tasty note with homemade ice cream sandwiches. YUM!!! Today was a little rough in many respects. I had planned on working out this morning but after staying up late waiting for the boys to get home (they went to a concert over 2 hrs away and they had over 2 hr rain delay) and getting woken up by them around 5 when they did get home, I’m exhausted! Once up, I attempted to make cinnamon rolls for the boys with what I had in the kitchen. No preparation = fail! I left them out for them anyway and got ready. I went to a memorial service for a dear friend today who passed away in a tragic car accident. After hearing his son speak and how pained he was that he hadn’t said “I love you” enough…PLEASE tell your loved one you love them NOW!!! After that, I came home and we made our trek back to Joe’s Crab Shack. After the hubs’ birthday fiasco there, a friend from high school read this blog and contacted a manager to set things right. They offered us a $75 food credit to come back and be a “VIP” with manager’s taking care of us. So we decided to go there today with our friends Matt and Kyle. The hubs came away with a crab coma and feeling like Joe’s had redeemed themselves with the service we got today. Matt and the hubs got a classic steampot that included two different types of crab legs along with andouille sausage, corn on the cob and shrimp. He loved it! I got a grilled chicken club without the bacon. I have no time in my life for bacon. When I think of what it is and the greasy-ness of it, I get really disgusted. Actually, beyond chicken and turkey sandwich meat, I rarely eat meat. It just doesn’t appeal to me. Anyway, the hubs was very happy which made me super happy. Thanks Daniel (friend) and Susie/Suzie (General Manager) for treating us so well and helping make our experience at the restaurant so much better! Note: Susie was so nice! She came over and personally apologized and thanked us for coming back to try it again. It felt very sincere so I really appreciated that! Our friend Melanie from college came and hung out at our house and then we headed to a late dinner. I wasn’t even hungry but I did manager to scarf down a slice of pizza. With the exception of the memorial service, today has been really fun. I’ve really enjoyed hanging out with Melanie and Matt. Now it is off to bed since we have an early church service tomorrow! Isn’t it supposed to be spring? I guess someone forgot to tell Mother Nature this morning. And since our house’s heating/ac runs differently than most people’s, our house was 60!!! That is waaaay too cold for me! I know I haven’t posted in the last few days. It’s been sorta crazy. On Wed. night I fell asleep on the couch a little past 8pm. That is probably a new record for me. I cannot believe I was that tired! We had walked around the block and stopped at McD’s for a quick drink and I literally didn’t think I could get up out of the seat and walk home. My legs felt like bricks. So I guess it shouldn’t have been a surprise! Thursday is a blur. Neither the husband nor I can believe what we did. I guess nothing important happened. This just goes to show how boring my life is! 🙂 I do remember getting a small run in the morning that’s it. Friday was really fun! My Dad met me for lunch and got me a late bday present. He decided to get the book I wanted from the Borders down the street that I have been saving up my money for. The book is Martha Stewart’s Cupcakes. I’m not the biggest fan of Martha Stewart but after looking through this book…I needed it! I always love having lunch with my Dad even if it was super windy! Around 4pm, the hubs asked if I would like to go to the Louisville Bats baseball game that night. We made plans for him to meet me downtown for dinner. To keep dinner within our budget and because many restaurants do not stay open past 4pm, we went to T.G.I Fridays. My dinner was less than stellar. My chicken has caesar dressing all over it which I did not care for. I was assured that it would not be on there but I ate it regardless. But I do have leftovers for Monday! After dinner, we headed over to the ball field. On the way over we heard that it was nearly a sold out game despite the fact that it started to pour. We decided not to wait it out and went to a movie instead. I was exhausted afterwards and we soon headed to bed. Saturday, April 17, 2010 in Louisville meant one thing to most Louisvillians, Thunder Over Louisville. Thunder Over Louisville is the country’s largest annual fireworks show and includes an airshow as well. However, the hubs and I have been several times (only once together) and find that it is usually crowded and hot. Many times, I have been at Slugger Field (where the Bats play) and I think that is the best route to go. You get a baseball game, clean bathrooms and a nice place to sit down. I have a short attention span so I can’t stand just sitting around all day. Have a game to break up the time is much needed. Since we did not have plans to go to Thunder and because we had already slept too late to really get a good workout at the gym before it got crowded. We both agreed to go later in the day and to hurry so that we could visit the Farmer’s Market again. I don’t know how often we will buy things at the Farmer’s Market because it is more expensive but I really like going. We walked up and down Bardstown Rd. and grabbed a quick bite to eat before deciding to check out the Thunder scene. We wanted to beat most of the crowds and I had free parking at work (we saw parking for as much as $30) so we thought we would walk around a bit. We ended up scoring free Coke Zero and had fun looking at all the neat food and people watching but only stayed less than an hour. A new store opened in town and after calling my mom (she just took my Dad to the airport to catch a flight to see his Aunt Bobbie) we went to check it out. It is called Fresh Produce Warehouse. It is supposed to have really fresh and cheap produce so we def. wanted to check it out. We got a few apples and some locally made corn salsa. We got to taste it before buying and I loved it. I’m going to try to make my own after I gobble up what we bought. My mom bought several things and was very pleased with the prices. I thought the variety of fresh fruit and vegetables was awesome. While I’m still trying to learn to like a lot of vegetables, I can appreciate the varieties. They also had a whole wall full of locally made products which I really liked. Overall, a really neat store. I think we will be going back. We headed home and started scraping wallpaper. Whoever thought wallpaper was a good idea, has never had to remove it! Luckily, we only have a border in our bathroom but it has proved very difficult to remove. We stopped when we were about halfway around the bathroom. Then we chilled for the rest of the evening. Notice: no workout happened. We decided to do it Sunday after church. That leads me to today. And today could have been a lot better. I had to get up a little extra early to do a dress rehearsal of a skit for church. While getting ready, the hubs had bad news…our dryer wasn’t working correctly. It seems to be turning out but there is no heat so it won’t dry! What’s more is that we didn’t finish all of last week’s laundry so we had more that we had planned for this week. Not a good way to start the day! After church (skit went well) we headed to Walgreens to get a prescription taken care of and then went to mooch off my parent’s working dryer. We ended up doing laundry at their house for over 7 hours. I’m not even sure of exactly how long it was but I do know that we were there for at least 7 hrs. We did leave to run some errands but we could not get a lot of cleaning done at the house when we were doing laundry at my parent’s house. So with the exception of laundry, we have had a fairly unproductive day. We finally got all of our laundry done and headed home. I don’t like to clean but I immediately set out to put all of my clothes away and then tackle the dishes. So now that I am frustrated and tired, I’m going to get ready for bed. Hopefully I can get a workout in tomorrow. However, I cannot do anything too much since the mini is next week. AHHHHH!!! I can’t believe it is so soon. Hey guys! Sorry I haven’t updated since Saturday but I’ve had a good reason! My birthday was yesterday. Since it was on a Monday, we celebrated with my parents and bro on Sunday night at one of my favorite restaurants, Bravo! They have the best bread and dipping sauce I’ve ever had. Afterwards, we hit up The Comfy Cow. The Comfy Cow is a new little homemade ice cream shop in town. We love it. A few weeks ago, I received their e-newsletter that said they had a new flavor, Grapefruit Sorbet. I could eat grapefruit everyday but it gives me terrible heartburn. I immediately wanted to try it. We went that day and it was AWESOME!!! Probably my fave ice cream/sorbet of all time. I just crave it. We went back a week or two later and they ran out. After jokingly giving one of the owners a hard time, he said the flavor would be returning. So, Bravo! gave me free ice cream for my birthday but I was waiting for my grapefruit sorbet. When I had to settle for Crème de Menthe Cookies ice cream, I was not overly happy. I found the owner again and told him it was my birthday and came JUST for the grapefruit sorbet. We’ve decided that we are going to call ahead next time before we go. I have been so disappointed that I don’t even want ice cream after that. But, not to be a downer, when they do have it back…I’m gonna get a pint of it. I’d probably get a gallon if the hubs would allow me. Before dinner and ice cream, I was making cakes! Yes, I was making my own birthday cakes. The marketing dept. at work said that they couldn’t make anything so I should. Of course, I don’t mind baking. So I used my new cake pans (a gift from my best friend, Kim and her husband Jonathan) and set out to make some awesome cakes. 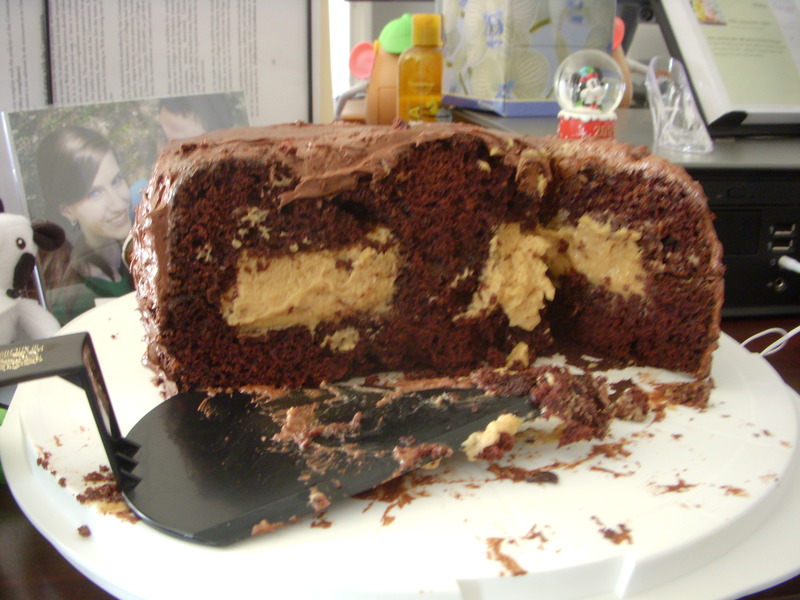 I made a chocolate cake with peanut butter filling and a peanut butter cake with chocolate filling and bananas. I did not make the icing because I have failed so many times, I didn’t want to waste time on trying to do it again. 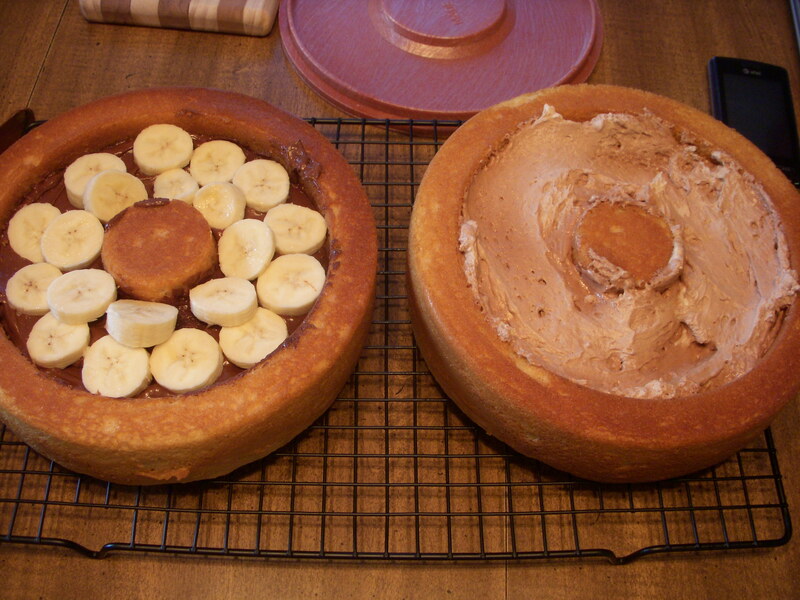 Both recipes (minus the filling) were Betty Crocker recipes (tried to link but can’t find it on their website. I got it out of my cookbook). The hubs went out and got me icing and it just happened to be Betty Crocker as well. So fun! As soon as I got to work on Monday, I set up a meeting for everyone to have cake after lunch. My coworkers seemed pretty excited by the looks of their IM status’. Love it. I received a free birthday bagel + schmear from Einstein Bros bagels. I was saving mine for lunch but I walked with Lauren so she could get one. While waiting for Lauren, they gave me a free Blackberry Lemonade! Happy Birthday to me! I was a pretty happy lady. Everyone seemed to really enjoy the cakes and, thankfully, I didn’t have a ton to take home. I did manage to snag a couple slices for the hubs and the parental units. And here is a pic of the inside of the cake. 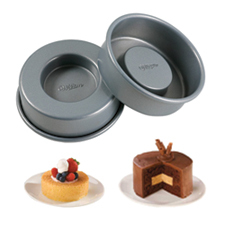 My new cake pans totally rocked! Yes, that chocolate cake was one of the best cakes I have ever made. It was sooo rich and yummy! After work, the hubs took me to The Melting Pot. I love the Melting Pot. We shared a dinner and a cheese fondue. Totally yummy. I was a little bummed though because I thought I had signed up for their e-club or whatever and that would have gotten me a free chocolate fondue. We skipped that part of the meal to save money and because I made cake yesterday. But I wish I had known. I’m now signed up but it will take me another year to get my free fondue!!! So that was my birthday. It was good. It didn’t really feel like my birthday on Monday because we celebrated on Sunday but was still fun nonetheless. Can’t wait to spend my Bed Bath & Beyond gift card from the bro and get some fun baking thing. Still haven’t decided what I want to get but I am more than ready to get something new! YAY!